Give A-Frame a high five for the release of v0.5.0! This release pulls in highly-awaited components from the ecosystem such as text and glTF, addresses several large WebVR Polyfill bugs for smartphones, comes with a slew of enhancements and bug fixes, and enables upcoming motion capture tools. 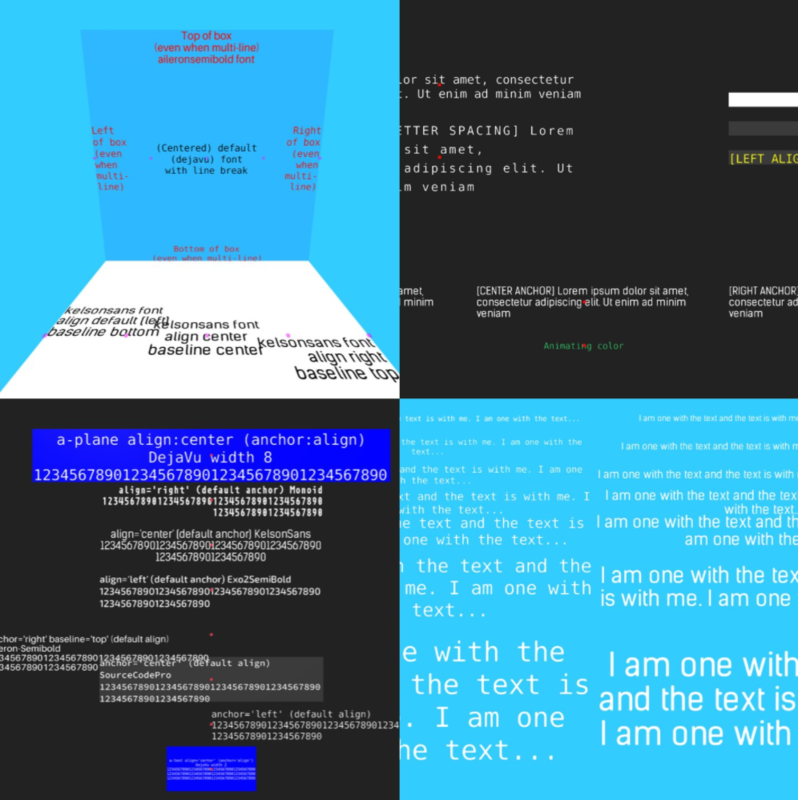 A text component, using SDF and MSDF, has landed into A-Frame core! Based on mattdesl’s three-bmfont-text, the text component has gone through a long lineage starting with @bryik‘s initial aframe-bmfont-text-component to fernandojsg‘s improvements to mchen‘s fork to mchen shepherding the component into A-Frame. The text component comes with several stock fonts and supports custom fonts, alignment, anchors, baselines, spacing, and wrapping. Read more about the text component. The glTF model component has also landed into A-Frame core! glTF (GL Transmission Format) is an open project by The Khronos Group providing a standard efficient 3D file format that is tailored for transmitting models over the Web. The gltf-model component loads a 3D glTF model with a line of HTML. Note that glTF is a fairly new specification and adoption is still growing, but a large portion of the WebVR community are optimistic that glTF will become the .jpg of 3D assets. Read more about the gltf-model component. 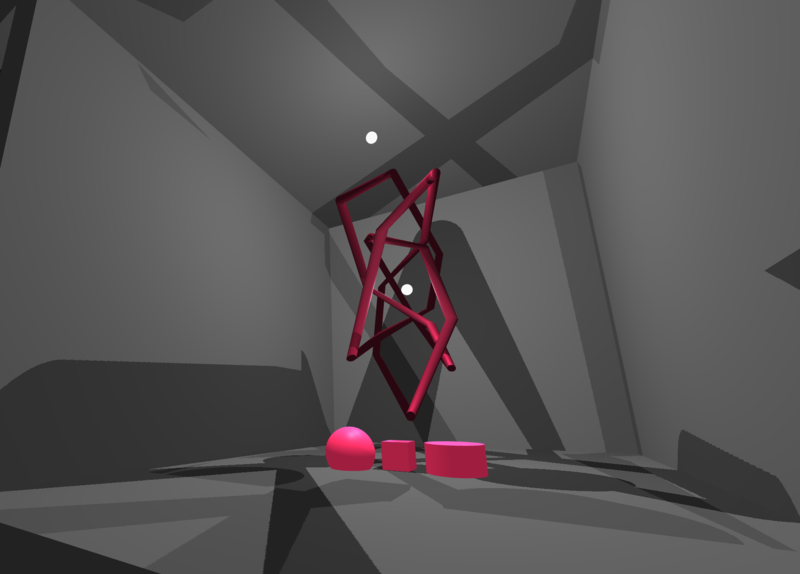 Thanks to everyone who worked on the three.js glTF loader (richtr, @mrdoob, @auradeluxe, @superhoge) and the A-Frame component (@donmccurdy, @xirvr)! Fixing mobile iOS resolution and bluriness. Thanks to nullcode for the fix! Fixing Cardboard support for many mobile devices, especially those with large screens. Thanks to @thoragio for forking WebVR polyfill to update its device database. Fixing and forking WebVR polyfill for better WebView support. Thanks to grigorkh for the fix and andymartinwork for QAing. The Inspector also contains a slew of updates including sample assets and texture modals so give that a look as well! Check out the release notes for the complete changelog, includes a list of all new features, optimizations, and bug fixes. A-Frame has enabled rapid innovation and open experimentation around room scale WebVR interactions and patterns! Check out some of these novel A-Frame scenes, or visit the blog to check out editions of A Week of A-Frame. Building a Bow & Arrow for tracked controllers in #webvr #threejs! Ready Player One? Tons of playable @aframevr classic arcade with Vive + Touch in one room. A-Frame now boasts nearly 120 contributors on the primary A-Frame repository! While we haven’t started seriously focusing on populating the A-Frame Registry yet, the A-Frame Registry now contains 25 curated components. Release cycles may seem a bit faster as our new friend, A-Frobot is generating new builds and supply fresh rawgit.com CDN URLs on each commit to A-Frame. Documentation will be automatically deployed. And we can test the bleeding edge version of A-Frame at https://a-frobot.github.io/aframe/. The largest and most awaited feature coming up is link traversal, which is dependent on stability in the browsers. Currently, link traversal works in Firefox Nightly. Shadows are also about to land and will go out in a subsequent 0.5.1 release. Keep up with the 0.6.0 milestone for an initial idea of what may be next. We’re holding an open Skype meeting amongst A-Frame developers to do talk about roadmap. Join #planning on the A-Frame Slack if you’re interested! We’re currently working on record-and-replay tools using motion capture of the headset and controllers, led by @dmarcos. Motion capture tools will enable a large realm of possibilities for VR development. You’ll be able to open a scene, start a recording, enter VR, move around with the headset, interact with objects with the controllers, and save the recording. Then later, you can replay the recording without needing a VR headset nor having to refresh and enter VR on each file change. Rapidly develop VR on to go, or send a recording for someone to take a look at! You’ll also be able to do motion capture. Not only could you record yourself, but you could record paths and events on entities. Imagine creating a non-playable character (NPC) whose movements are pre-recorded through dancing or drawing the paths of airborne enemies with your hands. Perhaps you could paint a work of art with A-Painter and have others spectate the painting being drawn live. A fun demo around this tool will be released shortly. As we can say is, A-Frame’s gonna shake it off!